In this sequence from Metamorphosis the early stages of a butterfly’s life cycle are explored through macro-photography and a scanning electron microscope. In 1975, hundreds of millions of Monarch butterflies were discovered in Mexico’s Transvolcanic Mountain Range. 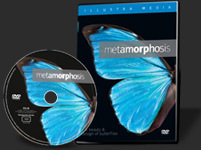 The extraordinary process of metamorphosis, and the inability of natural selection to account for its origin, are examined.